Dear readers: do not attempt to adjust your screen. Despite the gentle protests of our visual team, our view must de-contextualize momentarily, to allow for Le’s cut and fall vision to surface in a collection composed almost entirely of black silk and satin patchwork. The Lady Wrap wool textured pinstripe dress is an ode to clean, sophisticated lines. The lycra sleeveless turtleneck with sleeved wool cape and wool textured pinstripe culottes reveals Le’s devotion to tempering his expert techniques with the details of the feminine silhouette. This femininity is celebrated while imposing an angular severity. A host of satin patchwork skirts and silk taffeta blouses load the collection with marketable separates. Like the black satin patchwork gown, the seamless silk georgette brocade gown hangs beautifully. 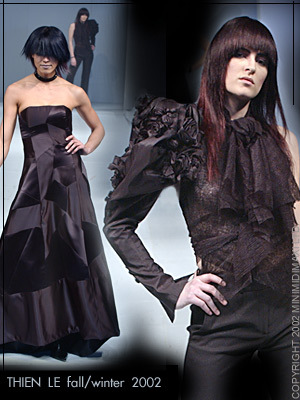 Thien Le’s collection is one of the brightest points in the Canadian fall/winter 2002 line-up. To operate at such a level of understated brilliance while apparently starting every concept at the drawing board is evidence of an innate grasp of the fundamentals of fashion. Beware of anything this man sets his mind to. Either that, or buy it.